Established in December 1800, Clermont County is the eighth oldest of Ohio’s 88 counties, and is the 11th oldest county in the Northwest Territory. Clermont is a French word meaning “clear mountains and hills,” which described the area when it was first viewed by French explorers in the 1600s. The first village, and the first Clermont County seat, was the Village of Williamsburg, established in 1796. In 1823, New Richmond became the county seat, and in 1824, it moved to Batavia, which remains the county seat today. Clermont County has a rich historical past. A number of Native American tribes called this area home, including the Shawnee, Miami, Delaware, Mingo, Ottawa, Cherokee, and Wyandot. The last Native American village in the county was located two miles south of Marathon in Jackson Township, along the mouth of Grassy Run on the East Fork of the Little Miami River. The Wyandot lived there until 1811. That location was the site of the largest frontier battle in Clermont County, the Battle of Grassy Run, where pioneer Simon Kenton clashed with Native American warrior Tecumseh on April 10, 1792. This area was also home to President and military hero, Gen. Ulysses S. Grant, born in Point Pleasant on April 27, 1822. He became commander-in-chief of the U.S. Army during the Civil War, led the Union to victory, and was the eighteenth president of our country. His birthplace in Point Pleasant (originally a one-room cabin) continues to welcome visitors today. In 1890, General Grant’s birthplace was removed from its original location, and traveled by boat to be viewed by citizens, along various waterways. It was also taken to the Chicago World’s Fair, before making its way back to Clermont County. There are numerous sites along the Ohio River in New Richmond, Moscow, and other communities that were prominent in the Underground Railroad. In 1905, John M. Pattison of Owensville became the first Clermont County resident to be elected governor of Ohio. Pattison also lived in Milford, residing in a mansion that is known as Promont. That structure is now a museum that houses a library and other historical memorabilia. It is located at 906 Main St. in Milford. A stone dairy house, built in 1800, is thought to be the oldest standing structure in Clermont County. It is located beside Harmony Hill on South Third Street in Williamsburg. Harmony Hill (one of the area’s first farms) was built by William Lytle, who was one of the first surveyors of the county. 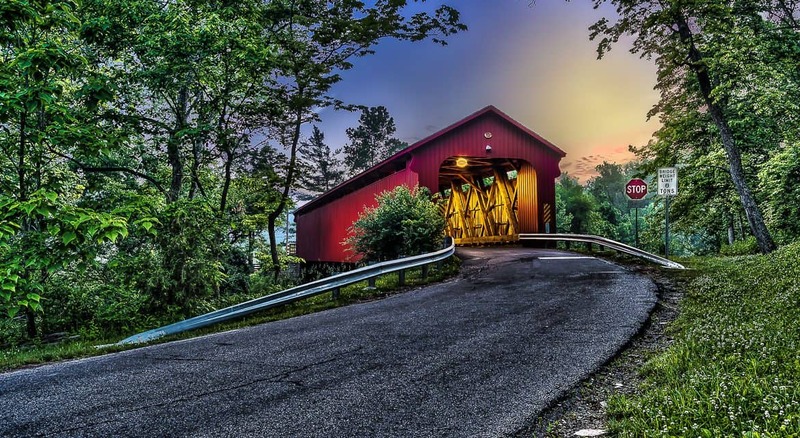 The last covered bridge in Clermont County proudly stands on Stonelick Williams Corner Road, near US 50; it was built in 1878. Among other notable Clermont County citizens, Hugh Nichols of Batavia, was the first Chief Justice of the Ohio Supreme Court in 1914. Clermont County has many other fascinating historical facts including: the Bullskin Trail (once a major pathway for Native Americans) runs north and south through the county along State Route 133, and was also used by frontiersmen Simon Kenton and Daniel Boone on hunting and warfare expeditions; John Hunt Morgan and his Confederate raiders invaded the county in 1863; George Washington once owned three parcels of land in Clermont County.